Software requirements and architectural design must be developed incrementally and synergistically. The term Twin Peaks was coined by Bashar Nuseibeh in his short but seminal article entitled Weaving Together Requirements and Architecture. 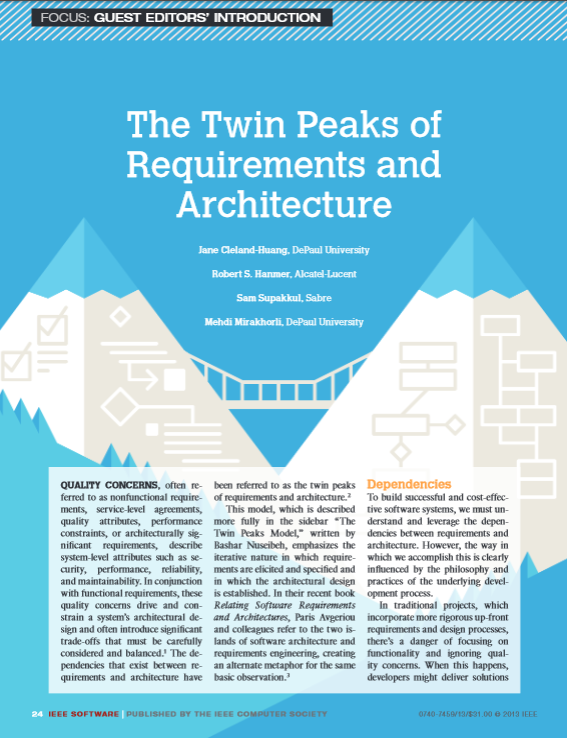 SAREC has engaged in research at the intersection of Requirements and Architecture over the past decade investigating ways to connect requirements and goals to the implemented system and exploring ways to elicit architecturally significant requirements. $27,000 Archie: Architecturally Significant Requirements, Department of Homeland Security, $27,000. 2013. Preserving, Generating, and Visualizing Knowledge of Architecturally Significant Requirements in Source Code. Jane Cleland-Huang, Distinguished Lecture, University of California, Irvine.